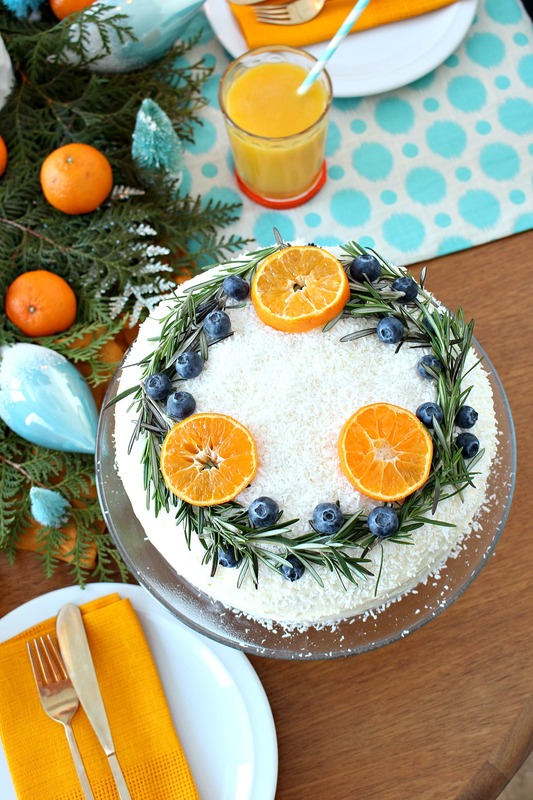 This carrot cake has such a beautiful, natural, wreath cake decoration and it’s getting me in a really festive mood. For some reason, I’ve become really obsessed with beautifully decorated cakes – my Pinterest “Desserts” board is full of them. I keep waiting for the perfect special occasion to go all out on some artsy homemade cake topped with piles of delicious candy and edible decoration (like this beautifully decorated cake or this one), but I just can’t bring myself to do it! Even though I’m treating myself during the holidays to some sweet treats, cutting back on sugar is always in the back of my mind and topping an already sweet cake with candy seems like a recipe for a stomach ache. For this dessert, I decided that I just had to add some holiday flair but, because the carrot cake was rich enough, I turned to the produce aisle in search of some decoration. 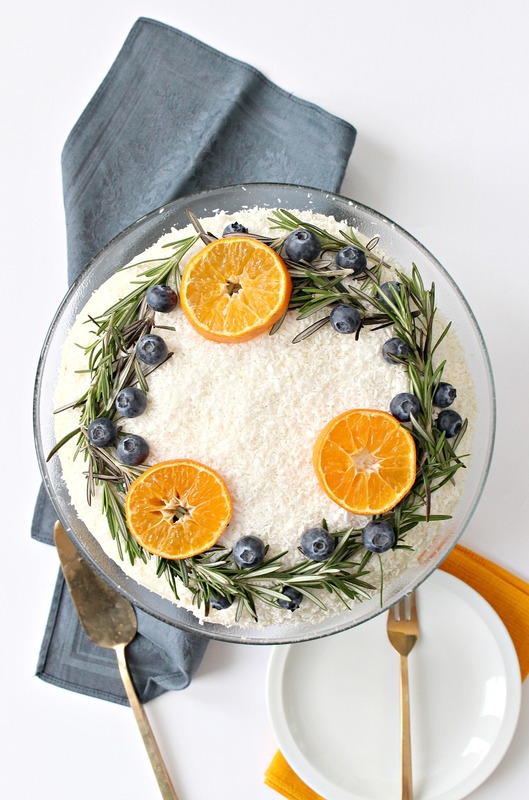 After topping my cream cheese icing with generous handfuls of unsweetened, shredded coconut, I used a package of rosemary, orange slices, and blueberries to create this pretty wreath topped cake. I LOVE how the wreath cake decoration turned out! Wondering about the taste? When it was time to serve the cake I removed the wreath and served the carrot cake plain and there was absolutely NO hint of rosemary flavor, even when the “wreath” sat atop my cake for a good three hours while I fussed with photos. We even had neighbors over for a slice and they were SO enamored with the moist carrot cake recipe – no one detected even a hint of rosemary. 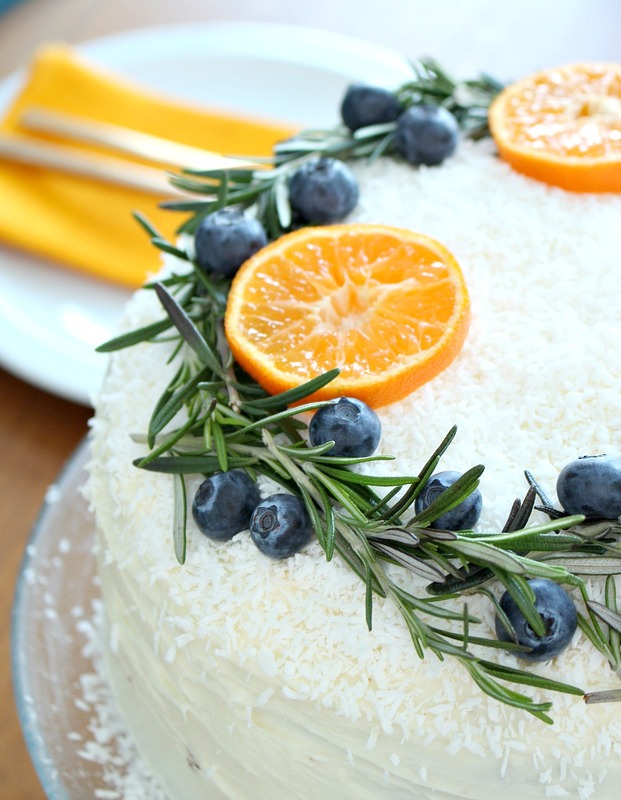 Unwilling to waste a delicious sprig, I set aside the rosemary for a slow cooker recipe (the coconut prevented any icing from sticking to it). Have I mentioned this cake is moist? I snapped that photo of the slice yesterday (Thursday) but I baked it on Sunday! It tastes so fresh, even after all of these days in the fridge. Here’s the recipe for anyone who is interested (and here’s a link to my sugar-free carrot cake, which is also pretty darn tasty). This recipe makes the deliciously tall, double-decker carrot cake I made. Beat the oil and sugar, then add the eggs and vanilla extract. In another bowl, sift the dry ingredients. Add to the wet ingredient slowly, mixing well. Stir in the shredded carrots and sour cream. Pour into two 9″ spring form pans and bake for 1 hour, or until a knife inserted into the center comes out clean. Beat the cream cheese, butter and icing sugar together until smooth. I’m no expert at decorating a cake, but I have learned to wait until the cake has cooled completely before icing. 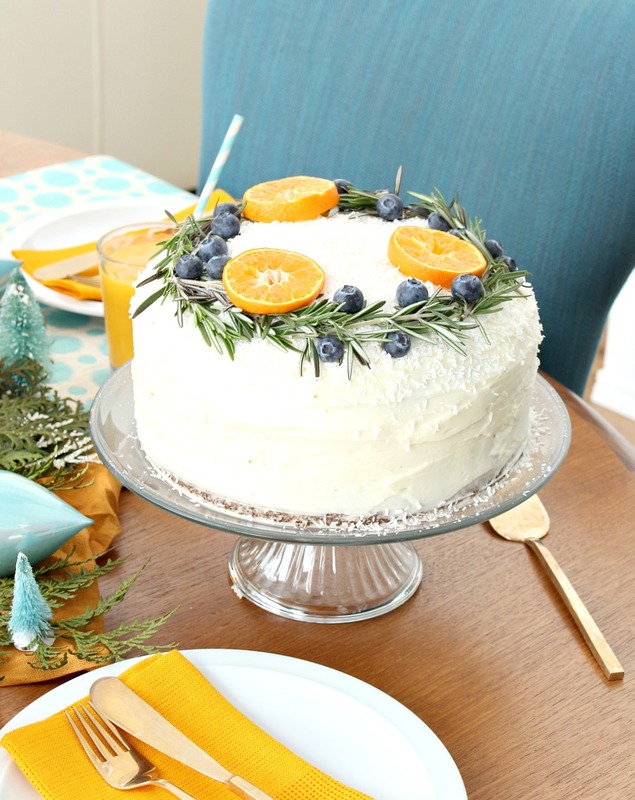 Place the first cake onto a cake stand or platter and apply a thin layer of icing to the top. Place the second cake on top and press gently. Then use a spatula to spread the icing onto the top and side of the cake. 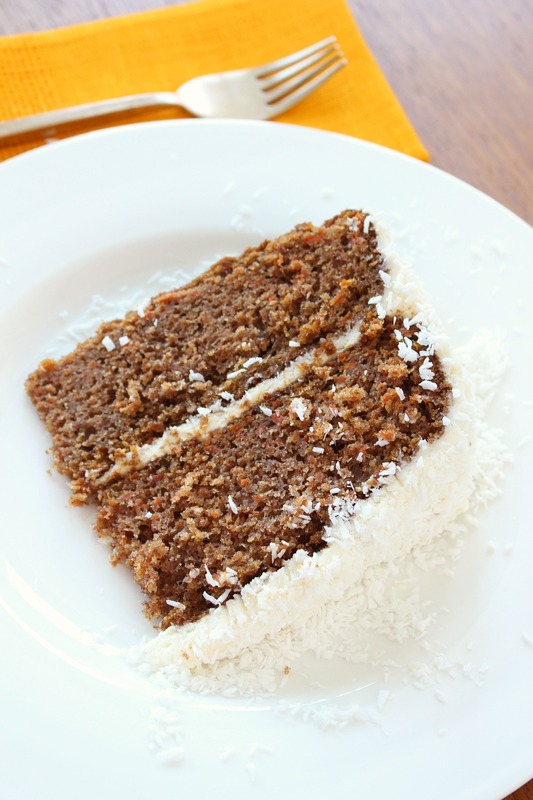 Sprinkle the top of the carrot cake generously with shredded coconut. Using kitchen sheers, snip the rosemary into approximately 2″ pieces. Place the small sprigs in a circle shape, angling them ever-so-slightly so some face toward the center and some to the edge, tucking in the ends when possible. 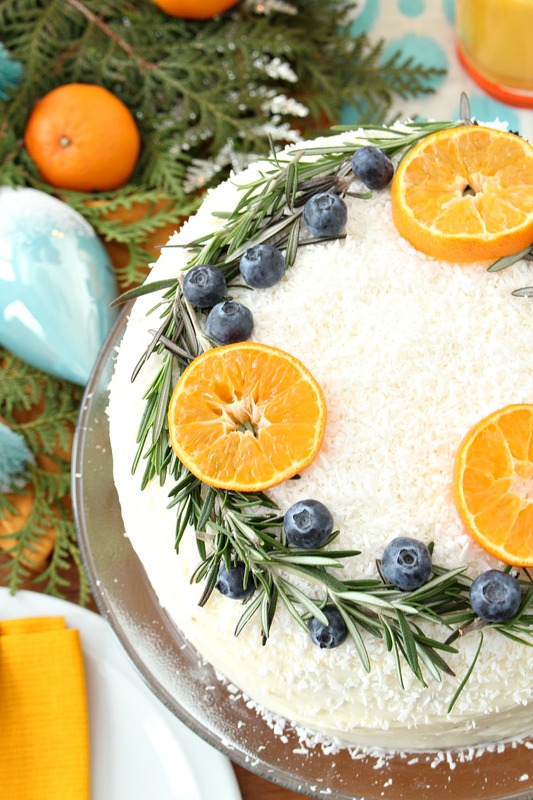 Add orange slices or berries – imagine how pretty cranberries would look! 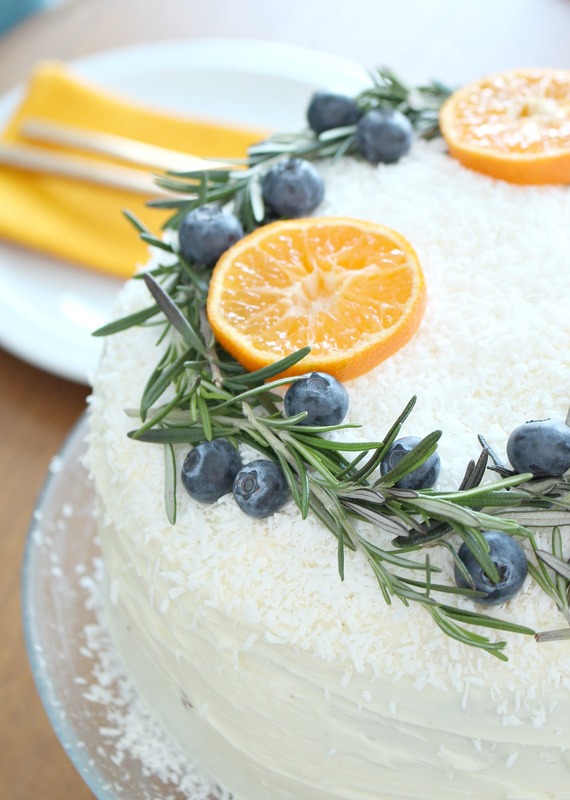 This was a delicious way to add a little festive, holiday flare to my cake, without adding more sugar! For a leafier wreath, I recommend fresh peppermint – which was my second choice, but I loved the classic wintry look of “rosemary,” which resembles evergreen wreaths. This edible ivy is pretty cute too. That cake is absolutely beautiful Tanya. I love the rosemary wreath. We have rosemary plants that are chest high this time of year and I use it in everything. I have never considered using it for cake decoration. Brilliant! By the way, I have been making lots of soap since reading your post on the diy gemstone soap. I have added fresh rosemary, finely ground as well as lavender from our garden. It smells delicious. Guess what everyone is getting for Christmas?? Thanks for the great tutorials. You're inspiring me to grow some of my own herbs! I love that you've been making soap and it sounds like it smells amazing. You've really made my day, I'm so happy to hear my post was helpful. I am sure that the recipients will be THRILLED with their gifts!! Mmmm! Thanks for sharing the recipe for this cake. My hubby's bday is New Year's Day and he's requested zucchini cake with cream cheese frosting. I think I will recommend this instead since he's really only looking for a vehicle for cream cheese frosting. 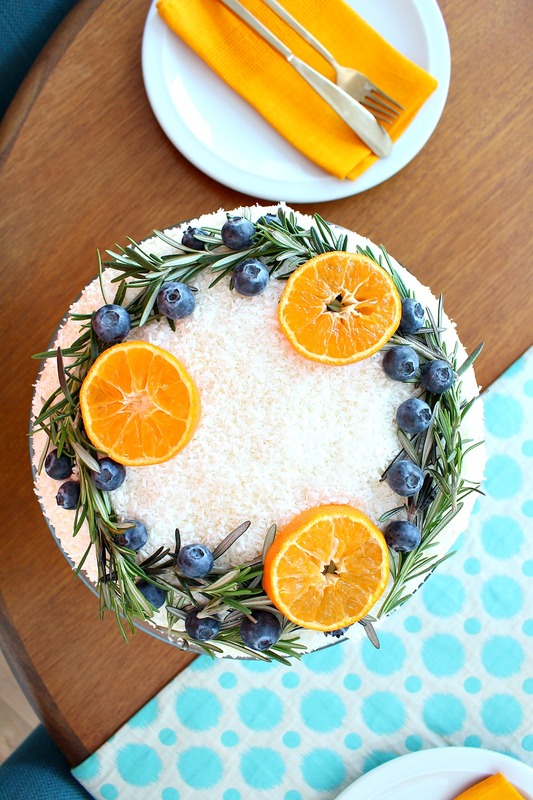 This will make a beautiful cake to serve on New Year's Day, birthday or not. Happy early birthday to Hubby! I totally understand just wanting a cake for the icing, lol. Wow Tanya ! All of it looks just wonderful ! The cake *and* the table setting ! Thank you for these detailed instructions. I'm definitely going to try it. Happy holidays 🙂 Emma. PS/ I love your new hair ! Thanks Emma! So happy you like the cake and the table setting – happy baking 🙂 (And thanks for your comment about my hair, I'm loving the new colors). This cake looks so succulent and delicious! Lovely. Thank you! It was, maybe a little too delicious, haha.